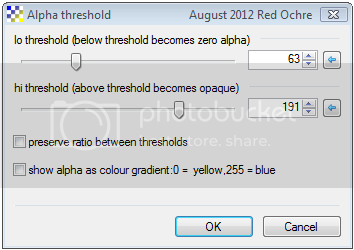 By Red ochre, August 16, 2012 in Plugins - Publishing ONLY! This plug-in is for adjusting the transparency (Alpha) of a layer which already has a range of alpha values. 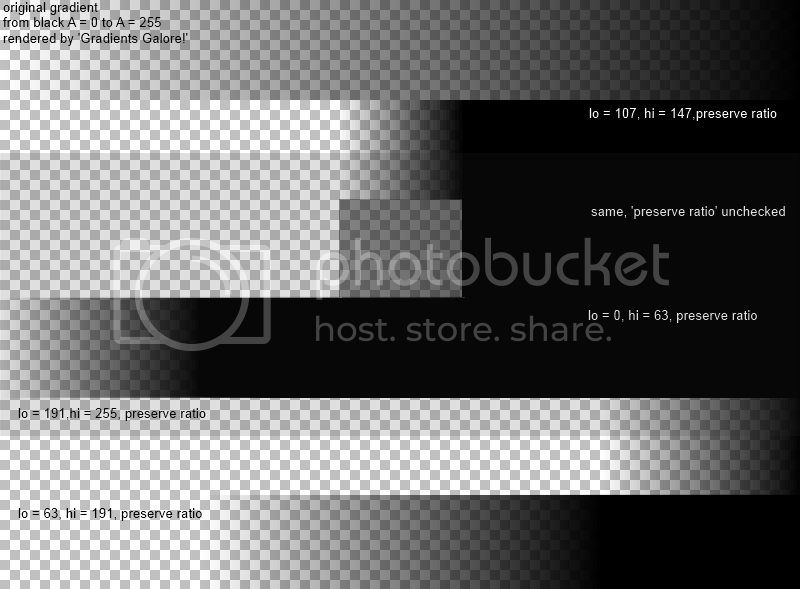 For instance a blurred object, intended to be used as a shadow layer. The controls are pretty self explanatory. The 'preserve ratio' check box will create a smooth transition of alpha values between the 'lo' and 'hi' thresholds. The colour gradient option is only there to see what's going on - not always easy when a nearly transparent layer is stacked amongst many other partially transparent layers. I've put it under Effects/Transparency as this seems the logical place to look for it, although technically it could be considered an adjustment. I haven’t added this to my plug-in pack yet, so if anything needs changing, let me know! The screen-shots will explain better. I've gone through almost every plugin posted on these forums and kept only 16. This is one of those 16. So keep up the good work. Unfortunate that the more technical plugins (i.e. the ones with transparency) never get upvotes. Some of my plugins are written just to explore an idea. (Many ideas don't lead to published plugins!). Others, like this one, were written because I couldn't find another way to do what I wanted. I'm glad you find it useful too and many thanks for the positive feedback! I've gone through almost every plugin posted on these forums and kept only 16. You're more disciplined than me!